On October 23rd, AdvancedTek had the pleasure of hosting the SME (Society of Manufacturing Engineers) Minnesota Chapter 11 October meeting at our headquarters in St. Paul. 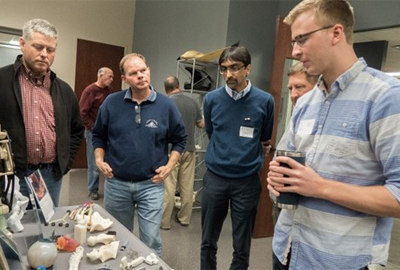 We had a great time meeting the members, presenting on our 3D printing technologies and giving them a tour of our TekCenter. The members of SME Minnesota 11 would like to thank Jason Bishop, David Kadlec and Matt Sargent of AdvancedTek for the time they spent hosting our meeting on Tuesday, October 23rd. AdvancedTek is a Platinum Level Partner of Stratasys 3D Printing & Additive Manufacturing (AM) Sales, Service and Supplies. They cover Minnesota, Wisconsin, Iowa, Nebraska, South and North Dakota. They are a local source for 3D-Printers and supplies and are often sought out as a trusted technical and service advisor. AdvancedTek services, clients can obtain concept models, prototypes, tools and parts for end-usage fast-er and with less expense than traditional services provide. Another important part of their business is providing cutting-edge product service and technological support, with the goal of being an AM repair center that is second to none. 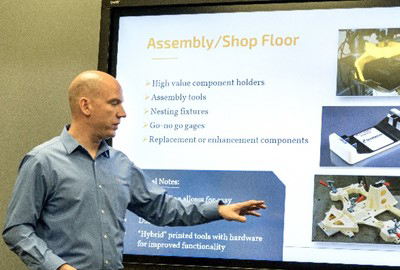 Jason Bishop gave an informative presentation of 3D-Printing or AM, that touched not just on how the technology started and evolved, but also on how rapidly raw materials are being developed – and with ever expanding capabilities. AM is now capable of providing products in hundreds, if not thousands of colors, with photopolymer materials ranging from rubber-like to hard, multi-colored to opaque, with finished parts being used for prototyping, tooling, fixtures and even finished consumer goods. FDM is probably the most common 3-D printing method, it uses a thermoplastic filament, which is heated to its melting point and then extruded, layer by layer, to create a three-dimensional object. FDM builds strong, dimensionally, stable parts with great repeatability. It also has the best accuracy of any 3D printing technology, and as with any AM process, a 3-D model is required. PolyJet printers have two or more jetting heads (some for the model and one for the support material) that spray outlines of the part, layer by layer, just like an inkjet printer, only the liquids are photopolymers. After jetting, the material gets cured nearly instantly by a UV lamp within the printer, creating a solid, plastic-like model that is precise and accurate. The support material is a gel-like substance, which is easily washed away. The finished model has a smooth finish that can be sanded, painted, drilled, or tapped. In BDM, metal powder and polymer binder are mixed to create feedstock binder, then after extrusion the part is immersed in de-binding fluid. The primary binder dissolves to create an open-structure throughout the part before sintering in a furnace. Of course, there is much more to additive technology than just the process and the printers. Jason’s presentation focused on how new materials are ramping up capability and reducing cost to the customer. An ever-widening range of materials are now available: since the first-used photopolymer resins, polyamides (nylons), and ABS, there are now specific engineered polymers such as versatile, highly engineered Ultem 9085 or metal powered alloys such as 17-4 PH stain-less steel. Visit https://www.advancedtek.com/3d-printers/materials-technology/ for possible materials! To sum up: Although 3-D Printing has been in use since the mid-1980’s, this technology is really still in its infancy—it continues to expand and grow at an exponential rate. 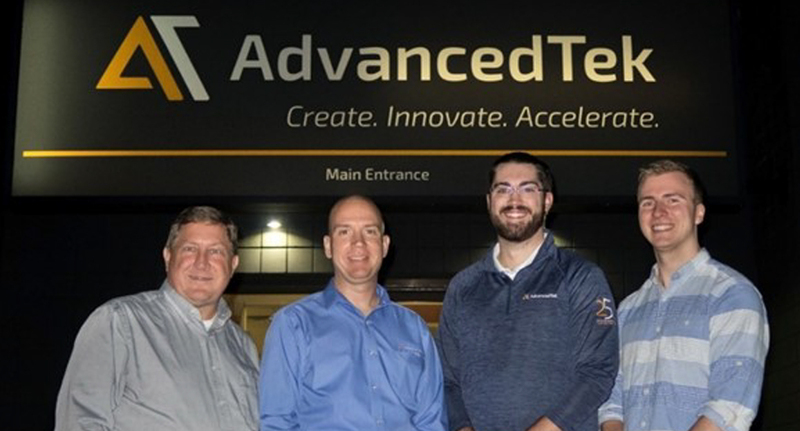 AdvancedTek is on the forefront of 3D printing and additive manufacturing, as witnessed by the company’s numerous awards, published articles, and cutting-edge models we saw during our tour. Coupling the company’s impressive knowledge base with the enthusiasm and expertise manifested by Jason, David and Matt suggests that AdvancedTek is a company to watch. To view the entire November bulletin, click here. 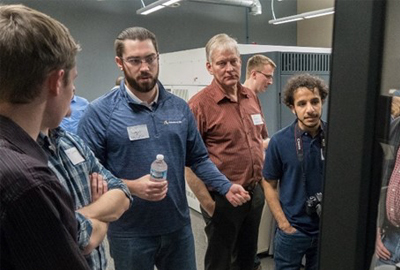 AdvancedTek would like to thank the SME Minnesota Chapter 11 for their visit. It was a great group that was highly engaged, sharing their experiences and asking good questions. If you’d like to learn more about the SME, visit their website http://www.sme.org/about-sme/.